There are, as I write this, 3 high-yielding funds giving investors over 5% in dividend income. Plus they pay out every month, tax-free. But, as I wrote in early December, this was a tempest in a teapot. The details are complicated, but the bottom line is that the most important types of municipal bonds will retain their tax-free status. 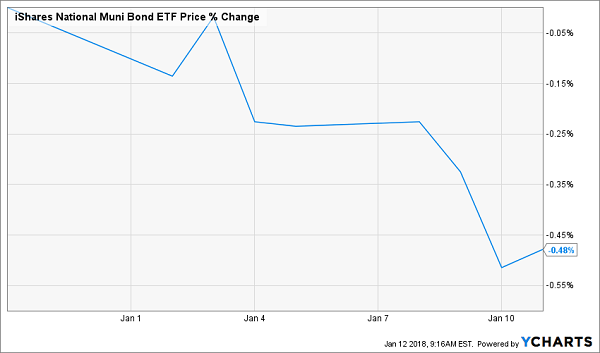 What’s more, too many investors are hooked on getting an income stream the taxman can’t touch—meaning demand for these bonds won’t go away anytime soon. That’s because the tax-focused investors who buy munis are the same kinds of folks who sell assets at a loss for the tax writeoffs—and most of that tax-loss harvesting (as it’s called) occurs during the last month of the year. At first glance, this might look worrisome—but it’s nothing to fret about. Yet PCQ isn’t worth buying now, because it’s expensive, trading at a massive 22.6% premium to net asset value (NAV). That means you’ll pay $1.226 for every dollar the portfolio is worth—this is a fund for suckers who love overpaying! But PCQ’s 5.3% tax-free dividend yield is nice—so let’s beat it with a fund selling at a 6.4% discount to its NAV. That’s right—a higher dividend income stream and a portfolio that’s being sold for less than its true market value. That’s what you get with the MFS Municipal Income Fund (MFM), which yields 5.5% and has been out-earning its dividend for a long time, making that income stream sustainable for many years to come. Take a look at the Nuveen NJ Quality Municipal Income Fund (NXJ). 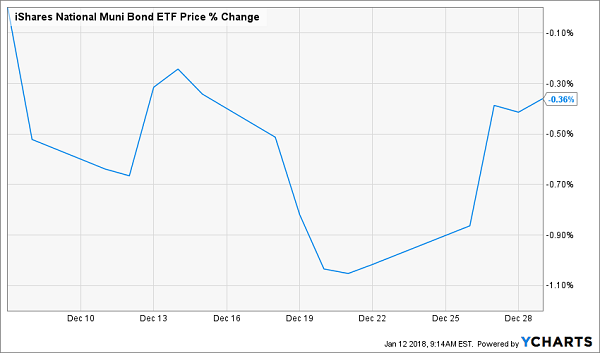 Despite having one of the highest total returns among municipal bond–focused closed-end funds, NXJ trades at the biggest discount of any muni CEF—a full 13.8%. The market doesn’t care—investors are selling this fund off because it’s been a bit chilly in New Jersey. But they’ll change their minds soon. 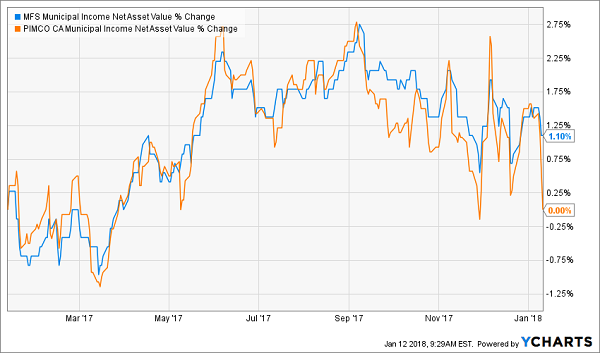 NEA’s tax-free yield is 5%, and it’s out-earned its dividend for years—which is why its annualized return is a bit higher, at 5.2% over the last decade. It’s also protected its NAV through good and bad times, including the 2007–09 Great Recession, so you know it plays good enough defense to survive tough times while providing a reliable income stream. 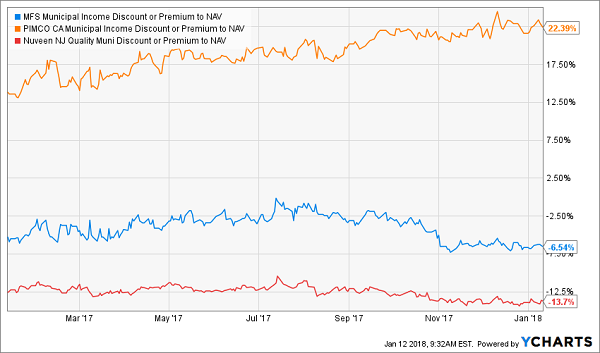 Because thanks to each of these funds’ outsized discounts to NAV, I’ve got each one pegged for easy 20% price upside in 2018—including our incredible 10% yielder! Don’t miss out on this incredible profit opportunity. Click here to get the full story—names, tickers, buy-under prices and everything you need to know before you buy—on all 4 of these off-the-radar cash machines now.